Australian ace David Johnson will make his second appearance at the Classic TT presented by Bennetts, again contesting the event in 2016 for Team York Suzuki/Motul Oils Racing. The Adelaide resident will ride an XR-69 1100cc Suzuki for Kevin Pearson’s York-based team in the newly titled Motorsport Merchandise Superbike Classic TT Race having enjoyed an excellent debut with the team in last year’s Motorsport Merchandise Formula One Race. The 32-year old took a fine fifth place, just 15 seconds adrift of the podium, with his fastest lap of the race being an impressive 122.914mph. Johnson is no stranger to the Classic racing scene either, being a regular at January’s Phillip Island Classic Festival where he has scored numerous wins and podiums on a wide variety of machines. The affable Aussie has excelled around the Mountain Course after making his debut at the TT in 2010 where he won the coveted Newcomers Trophy. His best result came in the 2014 RL360 Superstock race when he placed a brilliant fourth while his ninth place in the 2015 Senior saw him record his best ever lap of the Mountain Course, a speed of 131.595mph currently making him the ninth fastest rider of all time. Earlier this year, he made history at the TT when he set the fastest ever lap of the 37 and ¾-mile course by a British bike when, riding the factory Norton, he lapped at 130.872mph in the RST Superbike Race. He finished a brilliant seventh in the race and looked on course for a similar result in the PokerStars Senior until he tipped off at Sulby Bridge. He did, however, finish a strong ninth in the RL360 Quantum Superstock Race. A former racer in the 1980’s York’s Pearson set up his own team, named Big Dog Classic Racing, with support from the York Suzuki Centre, and has been a staunch supporter of the Classic TT since its inception. 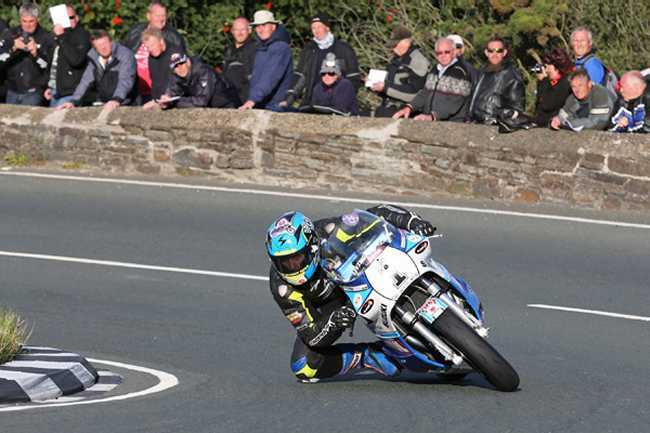 2014 saw Russ Mountford ride for the team, going onto claim a brilliant third place in the Formula One Classic TT race aided by a lap of almost 121mph.